Designed for high performance, your Powerline network can reach the data transfer rates up to 200Mbps*. With advanced HomePlug AV technology, the PLA401 v3 provides users the stable and high-speed Internet access. You just plug a pair of Powerline Ethernet Adapters into your house power outlets, and easily enjoy high-definition video streaming and network transmission. The advanced QoS features of ZyXEL's HomePlug AV Series improve the quality of multimedia streaming applications such as triple-play services, video streaming, high-speed Internet access and VoIP. 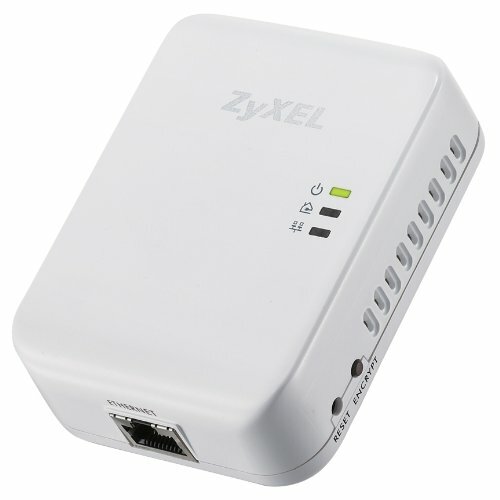 The ZyXEL PLA401 v3, a new-generation Powerline Adapter consumes 16% less power when comparing to the existing Powerline Ethernet Adapters. Moreover, when there is no Ethernet link, the PLA-401 v3 will enter the \"Standby\" mode that reduces energy wasting for over 50% when comparing to the adapters without this feature. Users can easily set up a secure connection between PLA-401 v3 and another HomePlug AV product within 2 minutes. By pushing an ENCRYPT button on your PLA401 v3, and then you can set up your hassle-free Powerline network. With the 128-bit Data Encryption Security (AES) feature, the PLA401 v3 provides secure network connection for Internet access and network resource sharing. You may sit back to enjoy fast Internet surfing experience and secure file transfer while leaving the hassles to the PLA401 v3.